People meeting to discuss local welfare issues with a local government official (blue shirt in centre) in Zurzur village, Melut County. In particular there were issues sounding the quantities of food delivered by the World Food Program. Morton, Chris. 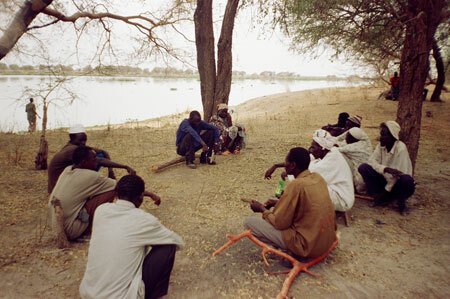 "Nuer welfare meeting" Southern Sudan Project (in development). 03 Jan. 2006. Pitt Rivers Museum. <http://southernsudan.prm.ox.ac.uk/details/2007.137.3/>.